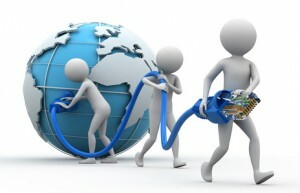 Supernet’s Dedicated Internet Access solution connects your business to the Internet at high speed. Supernet offers a range of connectivity speeds – all with unparalleled performance and reliability. With Dedicated Internet Access, you benefit from dedicated connectivity to our infrastructure without the need of expensive traditional leased circuits. Our connectivity is full duplex, so there are no limitations on the upstream bandwidth, delivering a truly corporate solution. Dedicated Internet Access has unrestricted usage so you benefit from reliable, uncontended, high bandwidth internet connectivity. By leveraging massive recent improvements Fiber technology, Supernet can match, or in many cases, exceed the service levels offered by traditional lease circuits. With Fiber technology, the amount of switching equipment is greatly reduced, ensuring there is less reliance on the underlying infrastructure. The RTTs (Round Trip Times) for data on our Fiber network are exceptional. The Supernet Network Operation Center ensures that the connectivity is maintained at the levels defined in the SLA. Please contact one of our dedicated account managers for further advice and information on +84 (8) 39104703 or by fax to +84 (8) 39104702 or by email to sale@supernet.vn.